Migrant Youth Go From A Children's Shelter To Adult Detention On Their 18th Birthday In two-thirds of over 1,500 cases from April 2016 to February 2018, Immigration and Customs Enforcement put migrant youth into detention when they turned 18, according to government data. 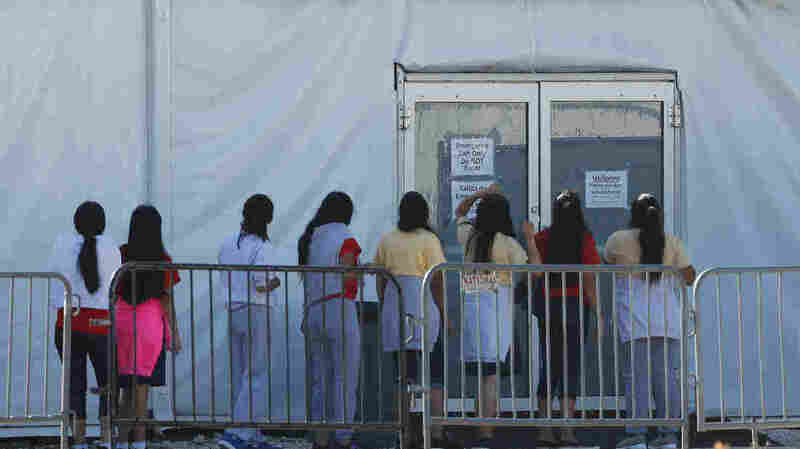 Children line up to enter a tent at the Homestead Temporary Shelter for Unaccompanied Children. Once youth turn 18, they are aged out of the children's shelter and are at risk of being placed in an adult detention facility. When migrant children cross the border without their parents, they're sent to federal shelters until caseworkers can find them a good home. But everything changes when they turn 18. That's when, in many cases, they're handcuffed and locked up in an adult detention facility. The practice is sparking lawsuits and outrage from immigrant advocates. Last spring, a 17-year-old girl named Lisseth made the treacherous journey from El Salvador to the Texas border and asked for asylum. She says she fled sexual predators in her hometown. As an unaccompanied minor, she was sent to the United States' largest federal youth shelter, called Homestead, near Miami. She described life there as regimented and dehumanizing. But she remained optimistic. Later, she was transferred to a different youth shelter in Miami, known as Boys Town, where she says kids were happier. Then, on the morning of Lisseth's 18th birthday — Sept. 23 — two uniformed immigration agents showed up at the shelter. They put ankle chains on Lisseth and drove her across town to a frigid holding cell. Thus began her new status as an adult detainee in the custody of Immigration and Customs Enforcement. "You feel horrible. Who would wish that on anybody on their birthday?" she said in a phone interview. "You feel like a criminal, handcuffed that way. No one tells you that on your birthday, not only will you not get to celebrate. On the contrary, two strangers are going to take you in handcuffs in a van to a detention cell that is freezing. The truth is I'm not a criminal — I have never been one, and I never will be one!" Lisseth spent the next two and a half months confined in the Broward Transitional Center in Pompano Beach, Fla. Gone were the classrooms, soccer games and snacks between meals. "The law says you're an adult, but you're not, psychologically and physically," she said. "How is my brain supposed to change into an adult overnight?" A pro bono attorney stepped forward to help, and Lisseth was able to find a sponsor — a family friend — with whom she now lives in Texas. She's waiting for her asylum case to be heard in immigration court. Her lawyer asked not to use her surname for fear it could hurt her case. The law says you're an adult, but you're not, psychologically and physically. How is my brain supposed to change into an adult overnight? Immigration attorneys are trying to outlaw what happened to Lisseth. "It [Homestead] is not great, but it's a center where the government has facilities for children. They have education. They're with other children. And all of a sudden on their 18th birthday, it all changes," said Lisa Lehner, director of litigation at Americans for Immigrant Justice in Miami. She has filed 20 lawsuits to free 18-year-olds who were taken from shelters and detained. In every case, ICE released the young adult. But the birthday arrests keep happening across the country. "I'm concerned with two things," Lehner said. "First of all, that our government is not following the law when it comes to dealing with children. And second of all, the traumatic effect this is happening on these kids." Child shelters like Homestead cannot, statutorily, house migrants once they turn 18. Homestead and the other roughly 130 youth sanctuaries in the country are overseen by the Office of Refugee Resettlement. Their mission is child care. In 2008, Congress enacted a law that instructs ICE to place unaccompanied immigrant children "in the least restrictive setting available" or find them alternatives to detention. Typically, that means finding a sponsor or a group home for them. Then, in 2013, Congress amended the rule to extend the protections to immigrants who turn 18 in U.S. custody. "What ICE is doing is not in accordance with congressional intent," said Lehner. ICE maintains that it is following the law. The agency says it treats every child who ages out of the system on a case-by-case basis, looking for "the least restrictive setting available, after taking into account the alien's danger to self, danger to the community, or flight risk." Once they're placed in ICE lockups, the teenagers can still get help finding a sponsor from deportation officers. But that process can drag out. Meanwhile, some 18-year-olds are deported, while others give up and accept voluntary departure. The National Immigrant Justice Center has filed a nationwide class action lawsuit to block ICE from jailing migrants who age out. "It's something that is of grave concern to us. There've been a significant number of children that have aged out that were ready to be reunified with their sponsors," said Neha Desai, director of immigration at the National Center for Youth Law. She has been granted access by a federal court to monitor the welfare of migrant children in U.S. custody. Desai is not involved with the class action. Government data, obtained in connection with the class action, showed that in two-thirds of 1,531 cases, from April 2016 to February 2018, ICE put migrant youths into detention when they turned 18. In the rest of the cases, ICE released them on their own recognizance or placed them in alternatives to detention. ICE birthday arrests have created such concern at the Homestead shelter in South Florida that the private contractor that operates the facility created a special "age-out case management unit." During a recent tour, an employee told NPR that caseworkers double down to find adult sponsors for youngsters about to turn 18 so they're not led away in handcuffs. As for Lisseth, if a judge allows her to stay in the U.S. — which is a long shot — she has a dream. She wants to go to college, get a law degree and become an immigration attorney so she can help young migrants avoid what happened to her.